Knot Just Weeds is all about the art of paper-making with Knot Weed. Albert Pantone, an artist who loves to make his own paper, decided to make some use out of that most infuriating and invasive Knot weed. 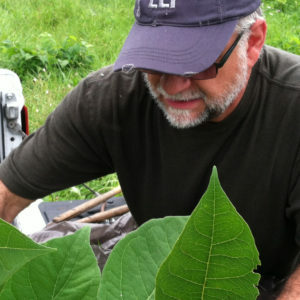 He shows people how to identify the plant. Mash it up into pulp, and cook the Knot Weed fibers. Finally, he shows his student how to press the fibers to make paper. His classes are fun, hands on art classes for all ages. 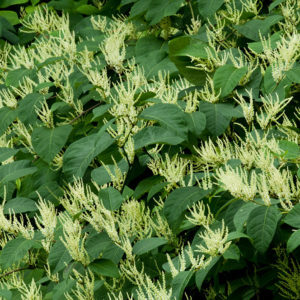 Japanese Knotweed, Polygonum cuspidatum, was introduced in the United States as an Asian landscape ornamental that thrives in sunny, moist areas such as riverbanks but has quickly adapted to roadsides, lawns, and recently demolished home sites. This non-native invasive has taken a strong hold over the region and requires consistent action to counteract its spreading rhizomes. If left unattended, this species will continue to outcompete native plant species completely altering our local ecosystem.